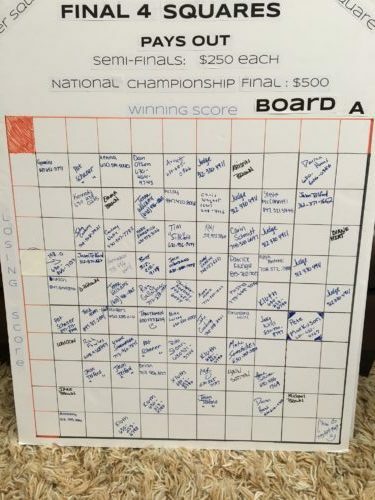 Thank you for entering our NCAA Final Four Square contest. Official numbers are posted. 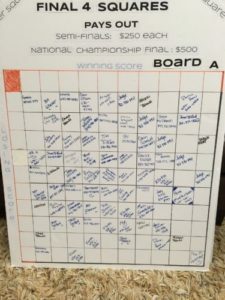 The original signup board is pictured below, it has been transferred to a computerized grid for ease of viewing. Winning Squares payout $250 for each semifinal game, and $500 for the National Championship game on Monday. A winning square must contain both the winner’s and loser’s final score (including overtime). For example, North Carolina beats Gonzaga 78-71. The winning square would have winner’s score =8, loser’s score =1. Winners will be contacted by telephone to arrange payout, if you do not hear from us by Tuesday, please feel free to email or call us. If a winning square is empty, those full donation will go to our charities.